There’s no doubting the invertebrate world is a dangerous place in which to live. It seems that for every creature, there is another creature that wants to eat it and the end can come from any direction, which is why many insects and spiders look and behave the way they do. Some are built for a quick getaway, others are almost as solid as rocks, and some have their own arsenal of weapons to fend off attacks. That’s all well and good when you can see your enemy coming, but some creatures have taken a different tack and have become experts at lying in wait and striking when it’s least expected. 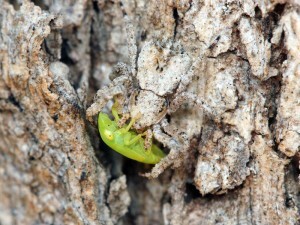 It seems as though the tree bark has come to life and attacked this small green leafhopper. 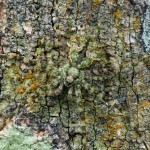 The “bark” is a Stephanopis sp. 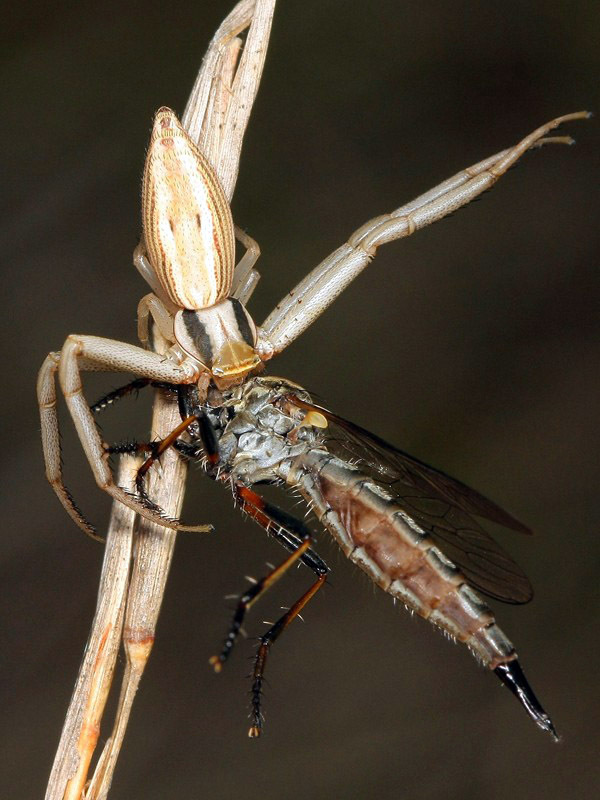 Perhaps some of the most efficient ambush predators are the Crab Spiders, which belong to the family Thomisidae. These generally small, squat spiders spend a great deal of their time doing nothing. 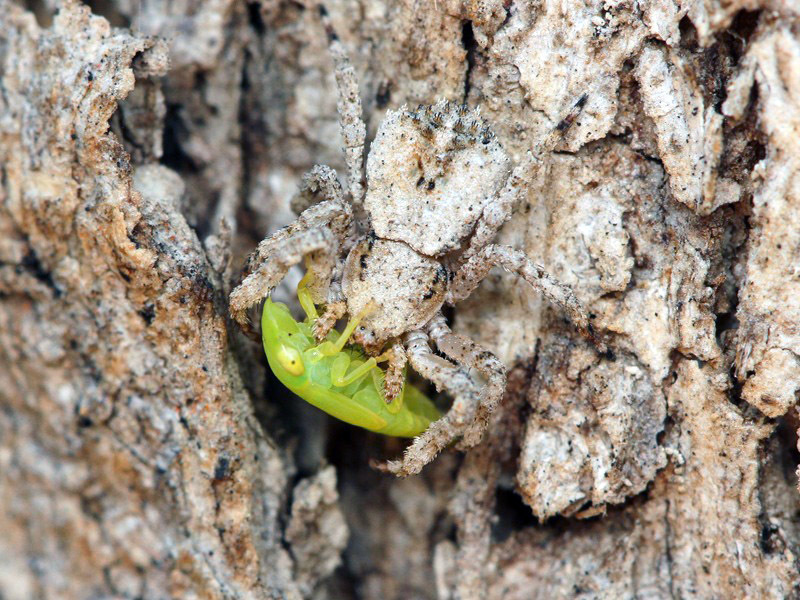 The first rule when preparing an ambush is to remain undetected until the very last second and many Crab Spiders have made this an art form. 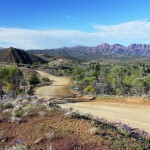 Some of the best examples you may never see are species from the genus Stephanopis. They spend their lives on the trunks of trees and some have almost become one with the bark, their rough, drab textures making them almost invisible. Other Thomisids, like the Zygometis xanthogaster pictured at the top of this article, come in a variety of colours, enabling them to sit and wait on flowers without arousing suspicion, hence their other common name, Flower Spiders. David and Goliath in miniature. 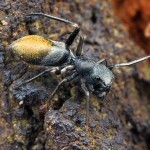 This Bomis larvata has dispatched a Camponotus sp. With enduring patience, the spiders wait, sometimes for hours, until their next meal literally comes to them. They have become so adept at what they do that even insects much larger than themselves seem to have no defence against them. On more than one occasion I have seen these spiders latched onto ants and sometimes the spider is no bigger than the ant’s head. The spiders obviously know the ant’s weak point because they always have their fangs sunk into the back of the ant’s neck. 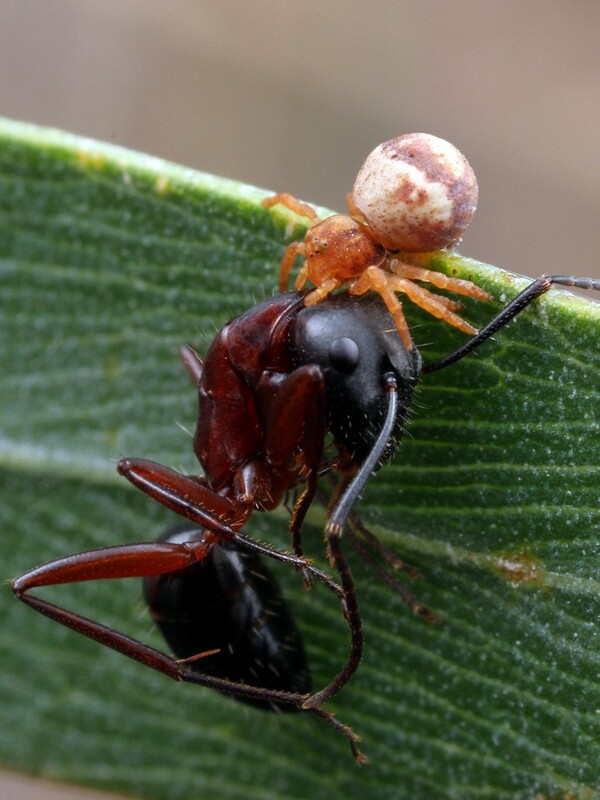 Something as powerful as an ant would put up quite a fight and has weapons of its own in the form of large jaws and a sting or formic acid, so the spider’s venom must be fast-acting and injecting it into the back of the neck will ensure it hits the nervous system quickly. The ant’s struggle is brief and futile. 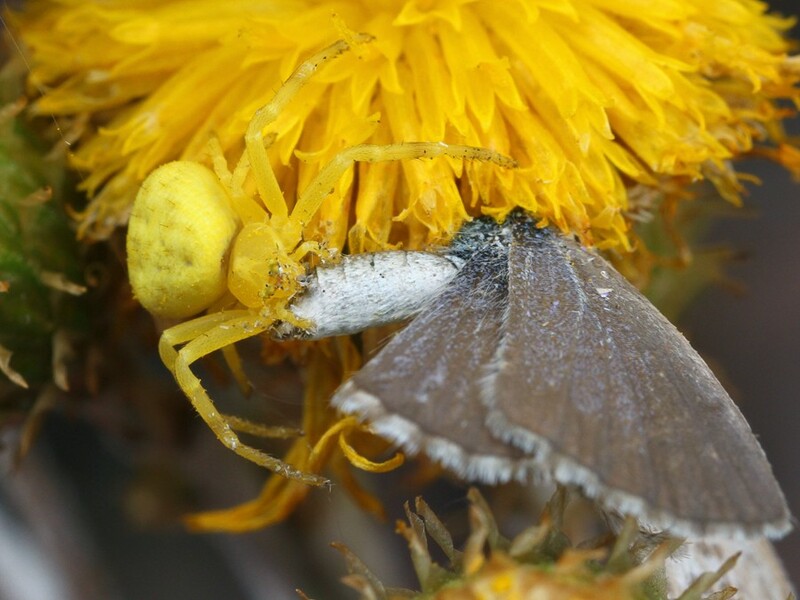 It seems that Crab Spiders are willing to take on any adversary in the pursuit of a meal. They will readily take bees and wasps when the opportunity presents itself and I have seen them feeding on Robber Flies, which are top predators in their own right, as well as other spiders. It seems that nothing is safe from these fiendishly clever little hunters. Whether you like spiders or not, you have to admire their bravery and cunning. For more photos of Crab Spiders, please visit the Thomisidae galleries. A straw-coloured Runcinia acuminata has used its camouflage to get the jump on a Robber Fly.